Someone stop me. 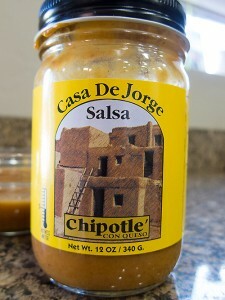 I just ate half a bottle of Casa De Jorge Chipotle Salsa sitting here at my computer. This is a very nice, low-medium heat salsa with a cheese chipotle taste. It is thick enough to get a nice scoop on a corn chip. Available at getmyslsa.com this chipotle salsa has cheddar cheese sauce, chipotle chiles and other ingredients like chunks of tomatoes.